Am I restless or what? 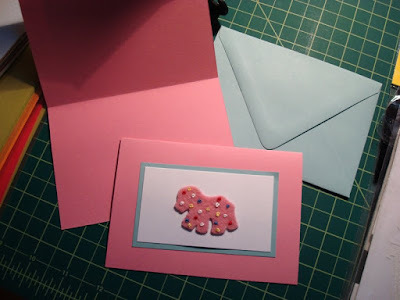 Not even three full days after I posted my Mother's Cookies notecards, I had redesigned another set, this time omitting the blue paper and going for a sleeker, more minimal look. The only reason I was using the blue border was because I had that color envelopes leftover from Elias's birth announcements. 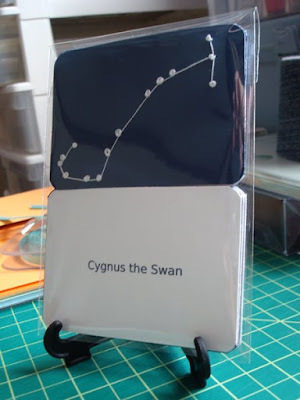 And since I've made the redesign the blue border is actually growing on me, but as soon as I posted the cards in my shop, something was nagging me to revise things a little. 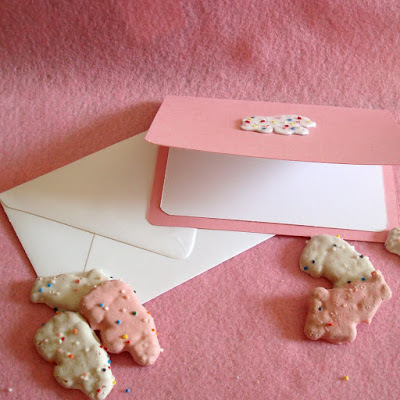 The revised cards are white cookies on pink paper with a lighter weight white paper on the inside, left blank for the sender's message of course, paired with a white envelope. 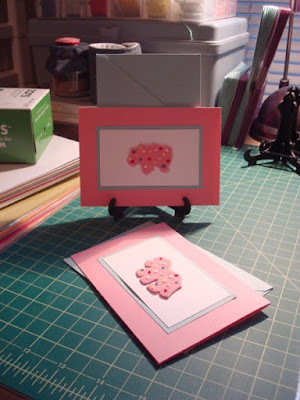 And vice versa (pink cookie on white card with lighter weight pink paper inside and pink envelope). Like the blue bordered set, the redesigned card is available as an individual note or as a set (or, for that matter, as I write in my product description, feel free to contact me if you need more than three). Both versions are now available in my Etsy shop. I've already had two sales, one of each design, which is incredibly exciting. Really made my day yesterday. And that's it as far as redesigns go. I've eaten the half-dozen or so cookies that remained by the time I was ready to photograph the second set (yep, what you see pictured is all that remained by that point). I'm actually not very creative. As often happens, this week's project is inspired by something I saw elsewhere and decided to make my own, slightly more crafty version. 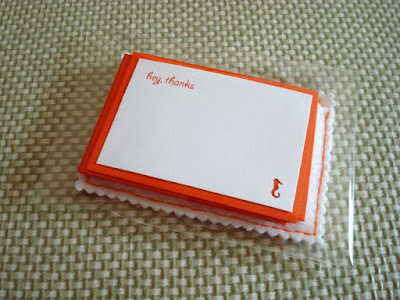 Standing in line at Paper Source with some pink and white paper goods for my Mother's Cookies notecards redesign (more on that in a later post), I noticed these miniature thank you cards. Great idea, right? Part of me feels a little guilty about making my own version for the Makery, but on the other hand, nothing wrong with a little competition. And it's not like I'm making any money off of these...yet! 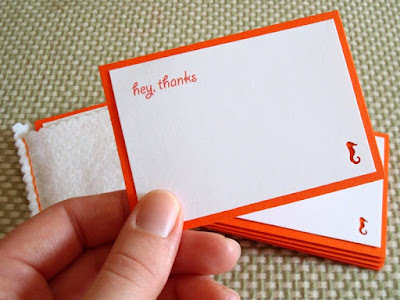 Anyway, my portable thank you cards are a tad bigger, measuring 2 1/2 by 3 1/2 inches. The white card is layered over some of that orange paper I purchased recently, as mentioned in my last post. I think I did a pretty good job of matching the ink to the paper color. Both the orange paper and "giddyup" font were inspired by the little starfish die cut motif. I've had this particular paper punch for awhile but had never used it in a project. It's a little random I guess. Seahorses seem like generous creatures, though, what with the males carrying the babies and all. The set of ten cards comes with a felt holder, which, sadly, will only hold about half of the set at a time. But, really, how likely is it that you're going to have more than a few people to spontaneously thank in one day? So carrying four or five at a time should be sufficient. Otherwise, you're probably being a little too generous with your gratitude. The cards plus holder are packaged in a cellophane sleeve and ready to send to the lucky winner, who will be determined from the names of folks who leave a comment on this post by the end of the week. If you like what you see, you know what to do. If you're new to the Makery, you can find some background info to your right. And, hey, thanks for playing! The alliteration is completely coincidental, I promise. And I should confess, right off the bat, that I broke my own rules this week, running to Michael's to buy all but one "ingredient" for this week's project. What can I say, I needed a break from myself. I have lots of pushpins on hand, left over from two years of working in a crappy studio where I did little more than pin stuff to the walls and then spend days contemplating my next move. So I thought I'd give the dozen or so metal pushpins that I have on hand a little makeover. Naturally, that involved pink pom poms. And I've learned a bit about pom poms this morning, as I edit my images and put together this post. Is it pom pon or pom pom, one word or two? I've always wondered that, ever since my middle school days when I belonged to a cheerleading-like dance troupe called, simply, Pom Pons. 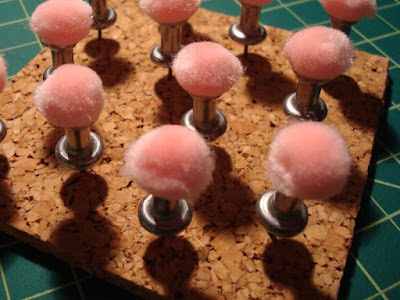 Turns out the word comes from the French pompon (not to be confused with the French sculptor), referring to a spherical ornament of some kind, like, in this case, a ball of fluffy, pink material. 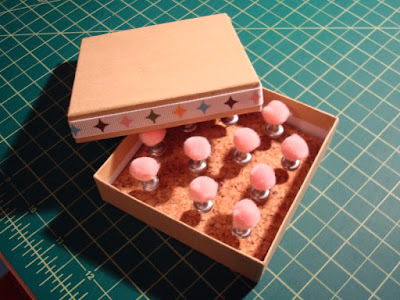 There are twelve pushpins in the set, each one adorned with a pink pom pom, and stored on a small piece of cork in a brown box with a decorative ribbon trim. If your bulletin board needs a little flair, leave me a comment on this post and I'll enter your name in the random drawing that I'll do at the end of the week to determine the lucky winner of this week's giveaway. 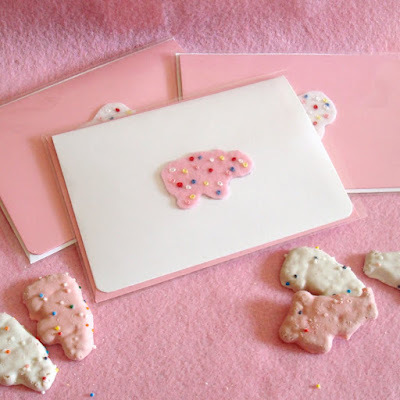 I also bought a few pieces of white and pink felt to make more Mother's Cookies notecards to put in one of my Etsy shops (not sure which shop is the appropriate venue). I'll post a link once they're up and available so stay tuned for that. After last week's project I wanted to do something else with embroidery, specifically employing the oddly satisfying French knot. Naturally, I thought of toying with pointillism, but embroidering a crafty remake of, say, Seurat's famous Sunday Afternoon on the Island of La Grande Jatte would probably take a little more than the week I give myself to complete each of these projects. I suppose I could work on something more ambitious on the side, but in the meantime, I had to think of what else I could use the stitch to create. Other than sprinkles and confetti, the little knots also reminded me of stars so I thought it would be fun to embroider a few constellations. 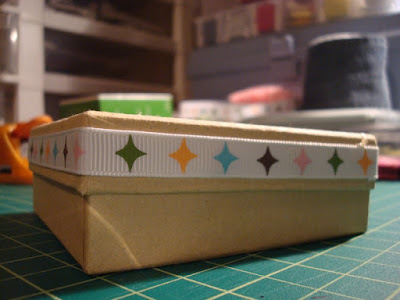 As usual, I wasn't sure exactly what to do with the embroidered paper but as (I thought) I had a couple more of the artist trading card holders similar to the one I used for the first Makery project, I thought I'd make a small set of flashcards. Since I had only one sheet of this dark blue paper on hand I had to come up with a way to select just a few constellations and went with seven summer star patterns. 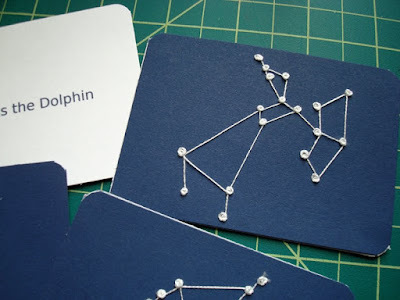 Each of the seven cards is backed with a white card printed, in matching blue ink, with the name of the constellation embroidered on front. Unfortunately, when I went to package the finished cards in the ATC holder, I discovered that both remaining holders are cracked, so I put the set in this plastic sleeve instead. Can you tell I'm not totally satisfied with this week's project? The embroidery was fun and I'm happy with the way the constellations turned out but I've noticed I have a tendency to design projects that are functional in some way. Like how I plopped last week's felt "cookies" on note cards. I'm never sure if I should just get over it or try harder to come up with project ideas that folks can use in some way. 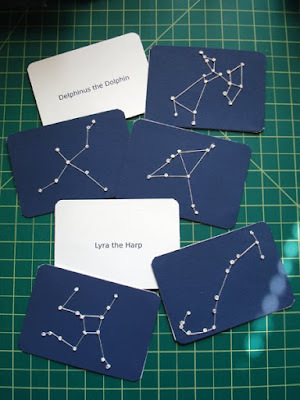 And I suppose flashcards are functional, if you want to learn seven of the constellations you're likely to see on a clear, summer night. If that's the case, leave me a comment on this post and your name will be entered in the random drawing I'll do at the end of the week to determine the lucky recipient of this project. Meh. I think I need a nap. Eight weeks into this project and I finally had to do a real drawing to see who would win the embroidered felt circus animal cookie stationery duo posted last Monday. With Neal as my witness, Meredith was the name I pulled out of the hat. Congratulations, Mer! Also on its way to you is a variation on week seven's hot cocoa for one. Since I had more cocoa mix, chocolate chips, and mini marshmallows on hand, and there were only two folks interested in that week's project, I decided I'd send the hot cocoa for one to Jolina and put together another hot cocoa kit for two for Mer (and Jef...happy belated birthday! 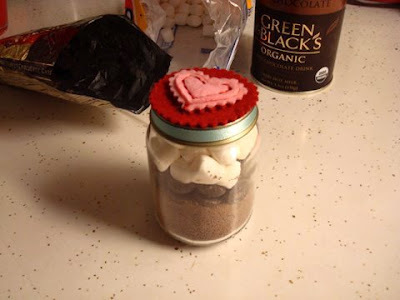 ), using a larger baby food jar and topping it with still more decorative felt from that V-Day bag that's made its way into several of the Makery projects. Everyone's happy! Unfortunately, while I do want to make more of the circus animal cookie stationery (I'm thinking a set of four notes - two white cookies, two pink - to attempt to sell in my Etsy shop), I'll need to actually go out and buy more felt since that V-day bag is finally down to a few, barely usable scraps. So to those of you who did not win this round, thanks for playing and, as they say, you can't win if you don't play (of course, you can't lose if you don't play either, but let's ignore that part). More felt, more embroidery, more stationery. This week's project - a set of two 3 1/2 by 5 inch folded note-cards with matching envelopes - is a sort of homage to Oakland-based Mother's Cookies, which I learned a couple of weeks ago went out of business last fall, meaning their frosted Circus Animal cookies are no more (except on eBay, of course). For now at least. Shortly after learning that the company went out of business I came across a few more articles that explained how Kellogg's, I believe it is, bought up the rights and recipes and plans to resume making the popular - and addictive - little cookies sometime this year. The closest thing I've found are Keebler's "animals cookies frosted" (that's what it says on the bag, just like that, in that order), which are okay but not nearly as good as Mother's. Even the color of the frosting is kind of dull and there are very few sprinkles (or jimmies, if you're on the east coast). Too bad for Mother's (not to mention all the folks who worked there) but probably not so bad for my diet. So I wanted to do something to celebrate these little cookies. I knew I wanted to use some of the pink felt left over from that re-purposed Valentine's Day gift bag I've gotten quite a bit of life out of, but I wasn't sure what. I've got a lot of paper products on hand so, as they say, when all else fails, make stationery (actually, no one says that, but that's what I did). 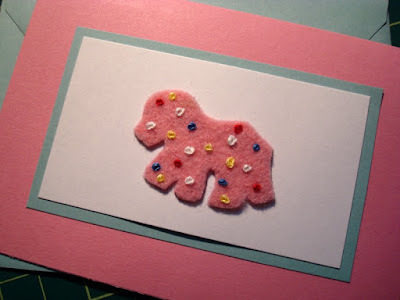 I cut out shapes from the felt scraps that vaguely resemble rhino and lion blobs and created the sprinkles by embroidering French knots in white, blue, red, and yellow (which, oddly, is loads of fun...I'm trying to think of what I can do next with this little trick...crafty pointillism perhaps?). 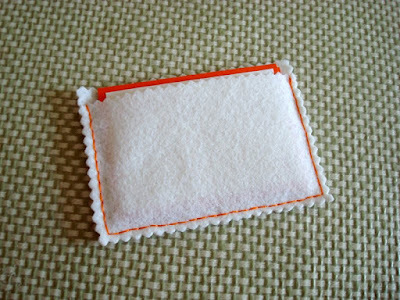 The French knots do double duty to adhere the animals to the white cards below. 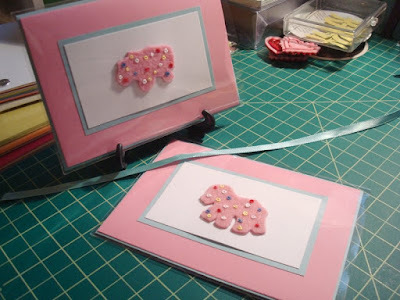 I mounted those to blue paper that matches the color of the envelopes, and then attached the whole thing to a folded note that matches the pink felt. I even have little plastic sleeves and a matching blue ribbon to protect and nicely package this stationery duo. Want a diet-friendly alternative to Mother's addictive little cookies? Have a fellow Mother's Cookies enthusiast with whom you'd like to correspond? If so, leave me a comment on this post and these little notes could be yours by the end of the week.